5 mins prep + 6 ingredients to make this Easy Instant Pot Applesauce. Imagine a sweet, warm, cinnamon-spiced homemade apple pie filling. Enjoy this smooth applesauce as a side or dessert. Don’t just save it for Thanksgiving! What’s better than welcoming Autumn with Apples picking and delicious homemade apple treats? I love the comforting and warm smell of apples and cinnamon fill every corner of the house. Have a bite of fresh-out-of-the-oven apple pie, with a sip of comforting hot apple cider. Maybe some sweet apple crumble with a scoop of vanilla ice-cream. And how can I miss the sweet, smooth & thick applesauce. mmMMmm…. 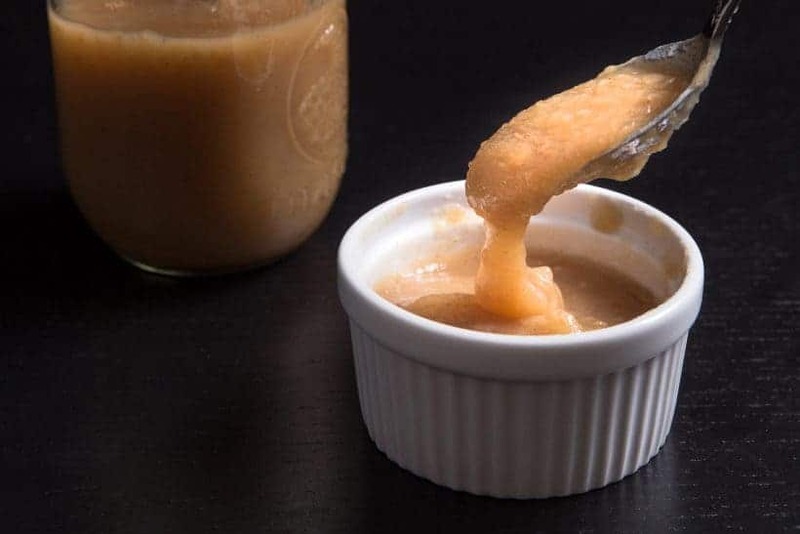 This thick apple puree is delicious as a condiment or dessert, served warm or cold, as a filling or topping. 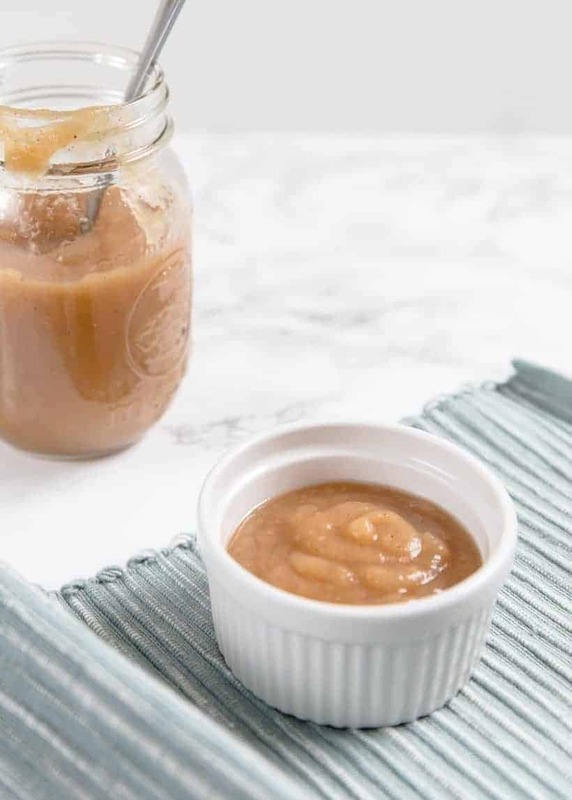 Our cinnamon-spiced Instant Pot Applesauce is irresistibly flavorful with a balance of savory, sweet, and slightly tart. Just the way I like my fillings for homemade apple pies. I couldn’t stop myself from licking the spoon! 5 mins prep + 6 ingredients to make this Easy Instant Pot Applesauce. Imagine a sweet, warm, cinnamon-spiced homemade apple pie filling. Enjoy this smooth applesauce as a side or dessert. Pressure Cook the Apples: Place cinnamon stick(s), ½ (1 g) teaspoon of nutmeg, ¼ cup (60 ml) of water and 3 lbs (1.36 kg) quartered apples into the pressure cooker. Close the lid and cook at High Pressure for 5 minutes. Turn off the heat and Natural Release. Open the lid carefully. Blend & Season: Remove cinnamon stick(s) and blend the applesauce into desired consistency with an immersion blender. Taste the applesauce and add a pinch of salt. Add honey to taste. 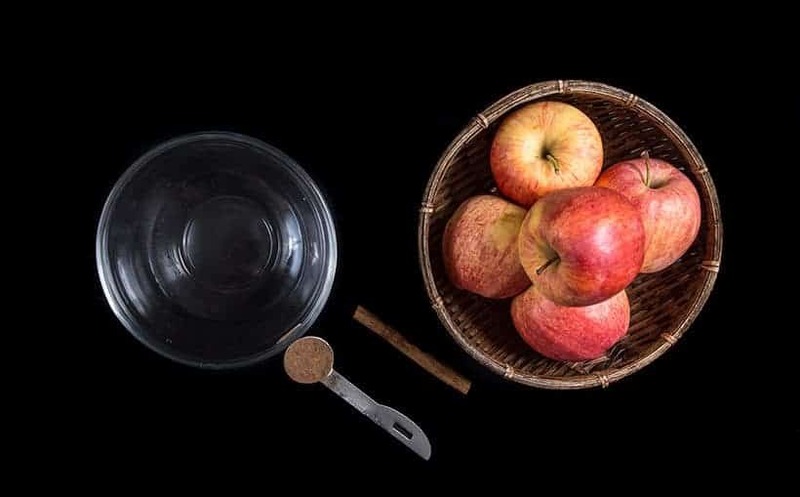 Taste Test & Adjust: Apples vary widely in their texture & flavors, be sure to adjust the sweetness/tartness to your liking. 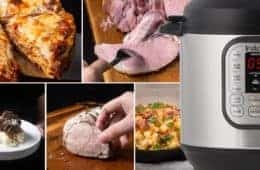 Have you tried it with a food mill after the IP is done with the apples? We haven’t tried food mill for this particular recipe. What a great way to make applesauce! Second time around I used only 3# apples, `1/4 c water and one cinnamon stick, 5 min high pressure, natural release. 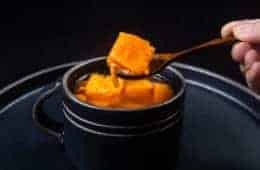 We like a coarser texture so I pulled the skins out with some of the flesh and used the immersion blender on them until they were a very smooth sauce then added them back in to as much of the pulp as I could remove from the IP leaving about 1 c liquid behind. Lovely taste, lovely texture thank you Amy and Jacky–I never was able to leave the skins in before and love the added nutrition that provides. The left over liquid made a lovely cinnamony, apple hot drink which I also enjoyed. Responding to the person with the MINI, you say 1/4 tsp water — is that really true? And how much do we cut the recipe for mini — timing remains the same? Thank you for your question. Yes, 1/4 tsp water as apple will release juice too. You will want to cut the recipe in half and the timing will be the same. This recipe was awesome. And so easy. The only mistake I made was to use my Vitamix to blend. Too powerful. Use an immersion blender instead. I used an electric hand mixer for about 10 seconds in the instant pot. It worked perfectly. I accidentally added 3/4 cup water instead of 1/4. Hope it will be ok still. It should just be thinner. How did it turn out in the end? I look forward to trying this. I have been making applesauce in my crockpot for years, but it takes all day. I do not peel my apples, but once they are cooked and softened, I work the applesauce through a cone shaped food mill, works very well. I then put it in sealer jars and hot water process it for 15 minutes (depending on your altitude and jar size) and it keeps for at least a year in the cupboard. Looking forward to hearing how you like this method. 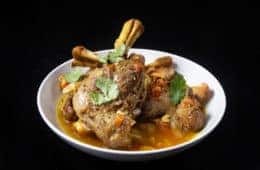 This looks like an easy recipe to try in my instant pot! Has anyone tried freezing applesauce? Applesauce freezes well. Just put desired amt in ziplock bags or seal a meal and freeze. After thawing, just cut off a corner of bag and squeeze out. So simple! I LOVE that this instant pot recipe(like all IP recipes) doesn’t heat up my kitchen in the middle of summer when our local apples are ready. Game changer!!! I also love how reliable Amy and Jack are so I know this recipe will work out, and so it did. Used ground cinnamon and doubled the recipe for my 8 qt (came to half full before cooking). Thank you for being so kind and supportive Katherine. We truly appreciate it! Hi, thank you for the wonderful recipe. I followed the recipe exactly except turning off the IP after 5 mins and did a NR 15mins. The apples came out very mushy, didn’t blend it but gave it a quick stir and it was too soft. Next time, will turn it off and manually time the NR time. Cooked apple will become mushy and soft so it is best to blend it completely. The best way to add more texture is to add some uncooked apple chunks into a blended applesauce. This may be a dumb question but I’m new. When making the applesauce and put it in ball canning jars, do I need to do anything else for storage? How long Can I store them in the pantry if the button in the lid is not pushed down? Hope that made sense. I don’t know how to can. You can store the applesauce in the fridge for up to 10 – 12 days. Dianna, you would need to process your jars in a boiling-water bath in order for them to be shelf-stable. There are lots of tutorials out there on how to do it, and it’s really not hard once you get the hang of it! Just made this and thank you! Very easy and delicious! I didnt have cinnamon sticks so used ground cinnamon instead (2 tsp = 2 sticks) and I ran out of nutmeg so I used 1 tsp of my Trader Joe’s pumpkin spice seasoning in its place! Turned out delicious! If I want to double the recipe should I double the amount of water? No need to double the amount of water as the apple will release a lot of juice. Make sure you don’t exceed the safety limit for foamy food! Made this once and loved it (so did my teenage daughter). Now she wants me to add other fruit to it. Have you ever tried making it with apples and strawberries? Do you think it would work the same (time and liquid)? We have made strawberry compote, but haven’t combined the two. The cooking time and liquid will be the same. I’ve been making it using what ever sauceable produce that’s on clearance at the grocery store. Tonight I’m using pears, nectarine, and apples. Earlier this week was different proportions of the same, plus peaches and plums. Two questions: Since the applesauce is foamy, should I only fill pot to halfway? I have the IP mini so need to cut down this recipe. Should I add more water since fewer apples? 1/4 tsp of water will be fine. Yes, you will want to cut down the recipe. Tastes great. So easy. FYI use the immersion blender a little at a time to get best texture I barely had it in there and it got way too smooth for me. But tastes fantastic. Love will do another batch soon. About how long should the natural release take? It should be roughly 15 – 18 minutes. Just made the applesauce and it’s amazing! Not sure why anyone would want store bought. I know exactly what is in this and there’s no added sugar or chemicals. So happy with your recipe. I made apple sauce twice before and it was too watery until your recipe. I read you shouldn’t put less than 1 cup of liquid in any recipe and I was a bit afraid to use only ¼ cup. But I went ahead and made it and it came out fantastic! It was also the first time I didn’t peel the apples as I didn’t realize the immersion blender could mix those in. For years my daughters put the applesauce through the food mill for us, the part I hated to do, when I made apple sauce on the stove. This is so much easier. Wow! Thanks! Tried to give 5 stars but it wouldn’t let me. Happy New Year and we wish you & your family a super healthy year! This was awesome! Someone gave us a basket of Red Delicious apples so that is what we used. We didn’t add any honey because the apples were pretty sweet on their own. Will use this recipe again. I look forward to discovering your other recipes! Thank you so much! Do you leave the seeds and core in the apples? And just blend them up?? The seeds should be removed. The core can be used for applesauce as well. So maybe a stupid question, but HOW do you remove the seeds but leave the core? The seeds can be removed from the core with a fork or paring knife. Can I make this without honey since I needed unsweetened applesauce for a recipe? I have tons of apples in my weekly produce box and want to try this. Also, can I use my vitamix to blend the apples since I do not have an immersion blender? Thank you :). Yes, you can make this without any sweetener. This nay be almost a year too Kate, but, unless you want super smooth, baby food like consistency I would pukse small ba6ches at low speed in the vitamix. Its so easy to over do with all 5hat power! We don’t have 羅宋湯 recipe yet, but it is on our long to-make list! Made this today and it is delicious! I added a little ground cinnamon along with the cinnamon stick because I really love cinnamon. It was perfect! Thank you for the recipe! I have 3 bushels of apples and want to try this because not peeling the apples will be a huge savings in time. If I load up my 6 quart IP, how much more water would I need? The liquid ingredients will stay the same, but keep in mind to not overfill the pot as applesauce is very foamy. I tried making this today with fresh apples from my neighbors tree. I wonder if there’s a difference between those apples and the ones you buy in the store. 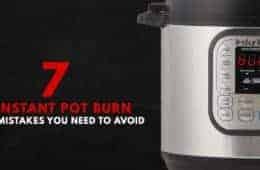 I couldn’t get the instant pot to come to pressure and so I canceled, re-tryed and still it wouldn’t work. When I opened the lid, it was very dry in my pot and some of the apples scorched. I added the amount of water specified in the recipe and the temperature had cooked the apples despite no pressure. I added at least 1.5 cups of water after removing the lid and used the immersion blender. Worked great not having to peel all the apples. 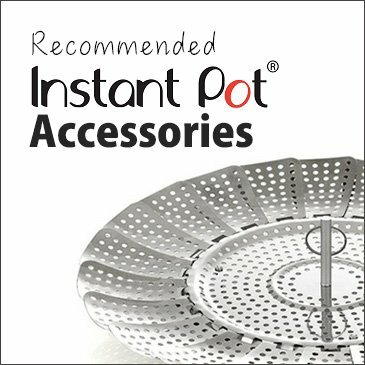 Unless the apples were very dried on its own, it sounds like the Instant Pot was leaking steam somewhere. It could be the silicone ring is not seated properly. About how many pint or quart jars will this recipe fill? About 2 pint or 1 quart jar. I made this but without the cinnamon and used about a pound of peeled peaches along with the apples, and it was very good and I’m not much of an applesauce fan!! Do you have any idea what’s a good place to start with the amount of honey? Or if you skip the honey do I need to add something else? Thanks!? Honey is best added at the end after tasting. You may not need the honey if the apples are sweet enough. Any tips on how to store it besides in fridge? I am loving your website and recipes! 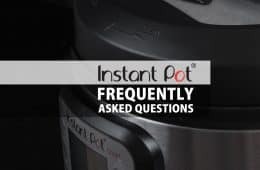 As a new Instant Pot user, your explanations are so clear and concise! Thank you! Since I don’t have an immersion blender (yet…), could I blend up the cooked apples in my Vitamix blender? Yes, the Vitamix blender will work. I plan to make the apple sauce without honey for my baby. How long can I keep it at room temperature? Homemade applesauce will keep at room temperature for 2 hours :)! You will probably want to refrigerate it if you want to keep it for longer. Remember, no honey for babies under 1 YO because of the risk for botulism. It is very hard to kill the spores even with heat. Just discovered your blog and love it! Thank you for including as much info and helpful tips as you do. It’s very helpful for newbies like me. With this recipe I see you only use 1/4 C of water but I’ve read elsewhere you’re always supposed to have at least a cup or so. Does the smaller amount work in this recipe b/c the apples contain a lot of water? I’m tempted to try this at low pressure b/c I wonder if that might preserve more nutrients than the high pressure..? Yes, the smaller amount work in this recipe as apple contains a lot of liquid. A few research papers have said cooking at pressure will preserve more nutrients than traditional stovetop method. I do not have an immersion blender. Could I use a hand mixer? Could I use ground cinnamon instead of sticks? 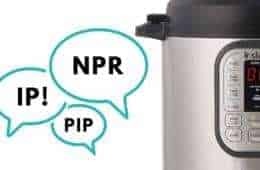 if you are using Instant Pot, you can press cancel to turn off the keep warm setting or just let it be. The keep warm setting on the IP will kick in after natural release at around 176F (80C). Hello! I am just learning how to use my new Instant Pot and your posts are so helpful in giving me the confidence to try new recipes so thank you! I made this applesauce a few days ago and the whole family loved it! I have a lot of pears needing to be eaten – do you think I could follow the same recipe for them? Thanks again! Thank you for your kind comment and congrats on your new IP!